The Real World (リアルワールド, Riaru Wārudo, 現実世界, Genjitsu Sekai), also referred to as the Human World (人間界, Ningenkai) AKA Planet Earth, is a place inhabited by humans and other organisms. The real world is a prominent feature in the Digimon series and is shown as being parallel to the Digital World via a inter-dimensional barrier. In most cases, aspects of the Real World are mainly focused in Japan, particularly within one of the 23 special wards in Tokyo. As a cliché, the real world comes under several attacks from Digimon and in some situations, close to total destruction. Odaiba is a large artificial island in Tokyo Bay. It is the home of the majority of the Chosen Children, with the exception of Takaishi Takeru in Adventure and Ichijouji Ken in Zero Two. It is the location of the unique Fuji TV building, the workplace of Yamato and Takeru's father (incidentally, in our world, Fuji TV is the channel where the Digimon series is aired). Many important fights took place in Odaiba, like the battle against Vamdemon at the top of the Fuji TV building, the battle against Venom Vamdemon near Tokyo Bay, and the battle against Armagemon at the Rainbow Bridge. Hikarigaoka is a district in the Nerima ward (練馬区), and the original home of the eight Chosen Children who fought in the Digital World in 1999. Minato is one of the special wards of Tokyo. The part of Odaiba the children live at, Daiba, is technically a part of the Minato ward. Ichijouji Ken and his family live in the Tamachi (田町) neighborhood of Minato, just across the bridge from Odaiba. In Adventure, during their search for the eighth Chosen Child, Sora and Mimi go to Tokyo Tower, and have to fight Death Meramon there. In "Odaiba Memorial", they return to the place with Miyako. In Adventure 02, a wild Triceramon attacks Ken in Tamachi while the area is under the effect of a Dark Tower. Daisuke arrives with Lighdramon and destroys the Dark Tower allowing them to fuse evolve their Digimon into Paildramon. They are ambushed by Mummymon and begin to lose until Qinglongmon's power ultimate evolves Paildramon into Imperialdramon. Shibuya is one of the special wards of Tokyo. In Adventure, as Yamato and Takeru rode the train to Takeru's home in Setagaya, they were forced to stop in Shibuya after Patamon had a fight with Takeru and ran off. This is where they met the fun-loving Gotsumon and Pumpmon, who called themselves "Shibuya Ward Digimon". Vamdemon killed the Digimon and tried to do the same to Yamato and Takeru, but Gabumon and Patamon evolved to protect their human partners. Setagaya is one of the special wards of Tokyo. In Adventure, Takeru lives in the ward's Sangenjaya district with his mother. About a year before Digimon Adventure 02, Mimi moved to New York City with her parents and befriended Michael, who also lives there. In "New York and Hong Kong, the Great Melee Battles", Daisuke, Ken and Yamato meet him at Miami Beach. His father flew Micheal and Daisuke to New York City to aid Mimi in returning wild Digimon in America to the Digital World. A Jyureimon proved to be problematic when he attacked the Christmas Tree in Rockefeller Center, but working together the Japanese and American Chosen Children pacified him and returned him to the Digital World. Most of "Digimon Hurricane Touchdown!! Supreme Evolution!! The Golden Digimentals" took place in the United States. Wallace, the Chosen Child to appear in the movie, was originally from Colorado, and lived in New York for part of the year in his search for his Digimon, Chocomon. China is where Koushiro and Hikari went in "New York and Hong Kong, the Great Melee Battles". Their first stop was Hong Kong, where they stopped the Poi Brothers from killing a rampaging Mojyamon and returned it to the Digital World. Then then averted a conflict between the China/India border between crossing Digimon and the Chinese military. They had one of the Poi Brothers' Octmon draw a message with his ink gun to communicate. In "Coral and Verailles, The Great Riot Battles", Jou and Iori aided the Australian Chosen Child Dingo in escaping Gesomon, Ebidramon and Shellmon. Their Digimon scared the three with mentions of sea food and they ran away. The three Chosen Children then had to defeat Anomalocarimon to destroy a Dark Tower. In "Coral and Verailles, The Great Riot Battles", Taichi and Takeru go to France to return wild Digimon. Takeru's grandfather, a frenchman, gave them a ride but stopped at the Palace of Versailles (Château de Versailles) when he sees the gate is left open and unattended. He rushed in with Taichi and Takeru in hot pursuit. They found the Mamemon brothers, Mamemon, Big Mamemon, and Metal Mamemon, who had taken residence in the palace and captured Catherine, a French Chosen Child. Taichi and Takeru's partners fought the Mamemon brothers while they freed Catherine. Catherine explained that she had been trying to destroy the Dark Tower in Paris but was ambushed by Giromon. Giromon shows up again to help the Mamemon brothers, but then Taichi and Takeru evolved their partners to the Perfect level while Catherine evolved Floramon to Kiwimon. They defeated the Mamemon brothers and destroyed the Dark Tower. Ken and Yamato went to Acapulco, Mexico in "Love and Borcht, The Great Fierce Battles". When in a Mayan temple at Palenque, they met Chichos, a little Mexican girl with a Gotsumon. Wormmon and Chichos did not get along. They found a Minotaurmon and Dokugumon in the temple and lured them outside where Were Garurumon, Stingmon and Monochromon sent them back to the Digital World. Moscow (Mocква́) was visited by Sora and Miyako in "Love and Borcht, The Great Fierce Battles". There they met the Russian Chosen Children: Anna, Yuri and Lara. They did not know how to communicate due to the language barrier, but Miyako resorted to using the names of Russian foods to describe the words "left", right" and "attack". They defeated their enemies, and had to fly to Siberia to beat a group of Flymon and Mammon. They were about to be defeated until Imperialdramon arrived and defeated them himself. In Digimon Adventure and Digimon Adventure 02, multiple real world vehicles are used, such as a Chevrolet Astro(Season 1 ep.30, 38), a VW New Beetle, a Mazda B-series truck(Digimon the Movie), and a BMW 5. 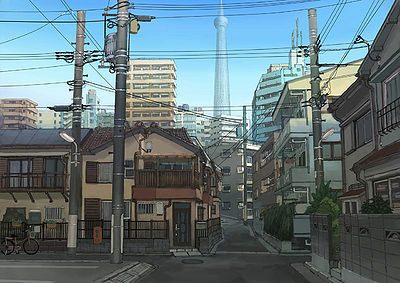 Shinjuku is one of the special wards of Tokyo, and the home of Matsuda Takato and his friends. Specifically, they live in West Shinjuku, which is mainly a business district littered with skyscrapers. West Shinjuku is also the location of Shinjuku Central Park, where Guilmon makes his home and finds a portal to the Digital World, and Tokyo Metropolitan Government Building, which houses the headquarters of Hypnos. The area becomes severely damaged during Vikaralamon's rampage and later is almost completely engulfed by the D-Reaper. Bunkyo is another of Tokyo's special wards. Ai and Makoto's grandmother lives in the ward's Hongo district (本郷), and when Impmon returns back to the real world with Takato and the others, he heads off to search for them there. Kitakyushu is a large city in Fukuoka Prefecture (福岡県). Akiyama Ryo lived there with his parents before he met Cyberdramon and followed him into the Digital World. He eventually returns to the Real World with the other Tamers and comes back to Kitakyushu, though he makes his way back to Tokyo to help fight the D-Reaper. Matsumoto is a city located in Nagano Prefecture (長野県). Katou Juri lives there along with her parents during the D-Reaper attack. The island of Okinawa is the home of Takato's cousin, Urazoe Kai, and their grandfather. In The Adventurers' Battle, Takato and Guilmon come to Okinawa to visit Kai during summer vacation. In the series itself, Takato and his parents run away from Shinjuku to Okinawa during the D-Reaper attack, until Takato decides to go back and fight with encouragement from Kai. Meguro is one of the special wards of Tokyo, and the home of Kanbara Takuya and his family. Takuya apparently lives in Jiyūgaoka (自由が丘), as he was asked to take a train to Shibuya from Jiyūgaoka Station and arrived there easily by foot. Shibuya is one of the special wards of Tokyo. The potential Chosen Children were asked to gather in Shibuya Station, where a lift would take them to an underground station filled with Trailmon. Yokohama is the capital of Kanagawa Prefecture (神奈川県). It is the hometown of Fujieda Yoshino, Daimon Masaru and his family, as well as the location of the Japanese DATS headquarters. It is the home-place of the Noguchi family. As part of the task of returning Ikuto to his biological parents, the DATS team is sent there. Austria is the homeland of Thoma H. Norstein's grandmother, father and younger half-sister. Though he was born and raised in Austria, Thoma is very neutral to it and thinks of Japan, his mother's homeland, as his own homeland. Stockholm is the capital city of Sweden. Thoma both studied and graduated there at the Stockholm Royal University of Science. Stockholm City Hall is briefly shown in the series' epilogue, as Thoma receives the Nobel Prize in Medicine. New York was breifly seen being destroyed by Dunasmos, following Yggdrasill's orders to save the Digital World. It is shown very briefly in the series as one of the areas with the weakened space-time barrier between the Earth and the Digital World overhead. Ulforce V-dramon, along with some Knightmon, attacked this area as part of Yggdrasill's orders to destroy Earth to save the Digital World. There are two ways of accessing the Digital World. The first is through an otherworldly Digital Gate; there are hundreds of Digital Gates strewn in set locations throughout the world. Two known gates exist in Mikami Canyon, where the first Chosen Children stayed for summer camp, and in the Hikarigaoka district, though the latter gate was sealed up in 2002. Another way, discovered in 02, is through a Digital Gate initiated through a computer. This is only possible with the use of the D-3 Digivice, and allows easy access to the Digital World from any computer around the world. Occasionally, a Digital Gate like this will randomly open, allowing anyone with any kind of Digivice to enter, as Taichi and Mimi did on two different occasions. The Digital World is very difficult to access in Digimon Tamers. Portals to the Digital World are actually highly unstable breaches of the space-time fabric between the two worlds. One such breach was found in Shinjuku Central Park by Guilmon in his hideout. There is only one known way to get to the Digital World; through an underground train station located in the lower levels of Shibuya Station. From there, several Trailmon depart to different terminals around the Digital World. There are two main ways of entering the Digital World - either via Digital Gates, which can open at random locations or can be artificially created through the use of space-time oscillation bombs, or through the use of the Digital Dive machine. Players of Digimon Online goes to an Online Center in order to enter the Digital World via the Matrix Chamber System. Atsushi and his friends meets up at Kusanagi City in order to go to the Online Center there and play Digimon Online together. This page was last modified on 3 December 2016, at 20:35.